Kinny’s debut solo outing is an original, colourful and up-to-the-minute brand of modern soul, featuring producers including Quantic, Nostalgia 77 and Hint. 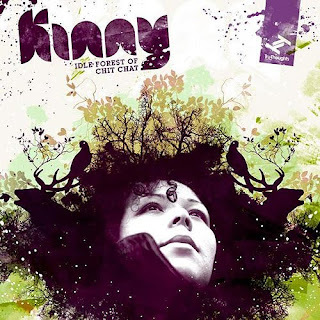 Working with seven different producers on ‘Idle Forest Of Chit Chat’ has enabled Kinny to push the boundaries of her own exceptional talent and expose herself to various styles and ways of working – from the tropical, live funk of The Quantic Soul Orchestra and Nostalgia 77’s deep modern jazz; through the catchy, soulful electronica of TM Juke and Souldrop; to Unforscene’s evocative soundscapes and a dose of lush, jazzy soul with a pop sensibility from Hint and Diesler. The result is an exciting melee of influences, all bound together by the unswerving class and charisma of Kinny’s persona. A Canadian national with a mix of Jamaican, Native Canadian Indian, French and Swedish heritage, Kinny – aka Caitlin Simpson – has always been immersed in an eclectic pool of cultural and musical influences. With a voice that sashays effortlessly between vertiginous, soaring melodies, steely staccato verses and caramel-dipped dulcet tones, it will come as no surprise that Kinny was a classically trained opera singer before the spontaneity and freedom of jazz, reggae and soul music lured her into pursuing her true passion. Describing herself as a ‘freestyle improv vocalist’, Kinny fuses a classical mezzo-soprano sound with the jazzy attitude-soul of the likes of Erykah Badu. Her hunger to cut the ties of convention and embrace new ideas led her to move to Bergen, Norway in 2001, after visiting on tour with her first band, Third Eye Tribe (who became well known in Canada and beyond for their electrifying live shows in which Kinny laid improvised vocals over electronic and dub beats). Bergen is a thriving musical melting pot of a city whose scene she describes as ‘a huge wave of music, covering everything from death metal to dub’. Likening the environment to her native Vancouver, Kinny finds inspiration and intrigue in the extreme seasons, the peace and closeness to nature that abounds in sparsely populated countries, and the vibrant and diverse music scene – which also counts the likes of Röyksopp and Kings Of Convenience – and many of Norway’s famously ardent purveyors of death metal – among its number. Kinny’s dinstinctive sound will be familiar to many as the voice of Kinny and Horne, whose previous album, ‘Forgetting To Remember’ brought her talent to the attention of the world’s most respected musical minds and tastemakers – including Daddy G, who invited her to audition as a vocalist for Massive Attack; and Andy Smith, with whom she is working on a set of tracks for a potential collaboration in the near future.